Use the IF function when you want to test something, and show one result if the test result is True, and a different result if the test result is False. NOTE: In many cases, another Excel function would be more efficient than a complex IF formula. See the examples below. 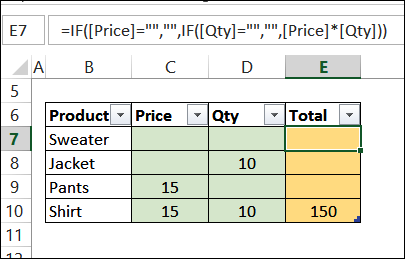 IF the Quantity cell is empty, leave the Total Amount cell empty. IF the "Local" check box is checked, add a sales tax. TEST something, such as the value in a cell. Specify what should happen if the test result is TRUE. Specify what should happen if the test result is FALSE. 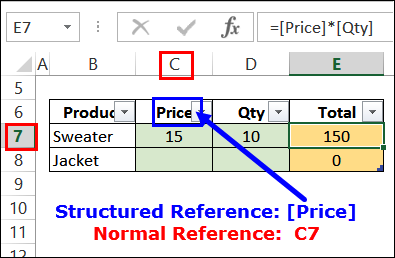 In this example, the Total in cell E7 should only show an amount if the Quantity has been entered in cell D7. TEST cell D7, to see if it is empty (D7=""),. 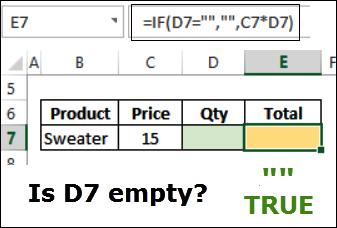 If D7 is empty (TRUE), the cell with the Total formula will show nothing (""). 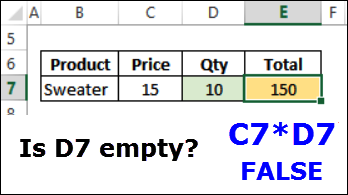 In the screen shot below, cell D7 is empty (TRUE), so the IF formula in cell E7 also looks empty. When cell D7 is not empty (FALSE), the Total cell shows the value of Price x Quantity. When building nested IF formulas, the order in which the tests are listed might be important. See the section below -- the hardest tests must come first. 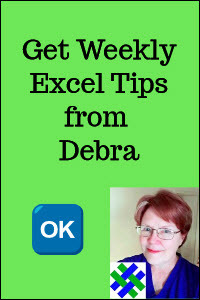 Some nested IF formulas can be replaced by a VLOOKUP formula, for more flexibility. See the example of converting numeric grades to letter grades for students. 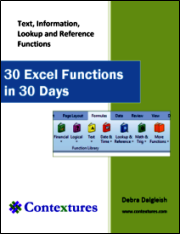 In this example, the orders are stored in a named Excel Table. As a result, there are structured references in the formula, that show the field names, instead of normal cell references. The results for each possible scenario are shown below. When nesting IF functions, be sure to put the hardest tests first, or the results could be incorrect. If the amount in cell B2 is 25000, the result would be "Good", because it is greater than 20000. Now, if the amount in cell B2 is 25000, the result of the formula would be "Average", because the results of that first test are TRUE. In this example, sales tax will be applied to local orders. On the order form, there is a check box that is linked to cell G11. 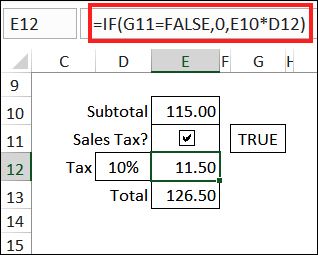 The IF formula in the Tax cell checks the linked cell, to see if it contains "FALSE". If so, the tax is zero. Otherwise the subtotal is multiplied by the Tax Rate.